Disney 50-Piece Mickey Mouse Tool Set Just $11! Was $22 PLUS FREE Shipping! You are here: Home / Great Deals / Black Friday Deals / Disney 50-Piece Mickey Mouse Tool Set Just $11! Was $22 PLUS FREE Shipping! Wow! This is a great deal, too! 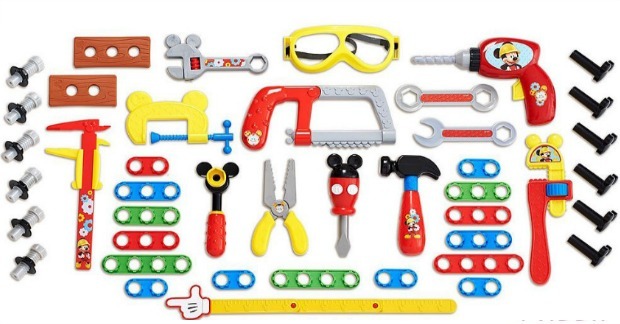 You can get this Disney 50-Piece Mickey Mouse Clubhouse Mousekadoer Tool Set for just $11! Down from $22! PLUS FREE shipping! 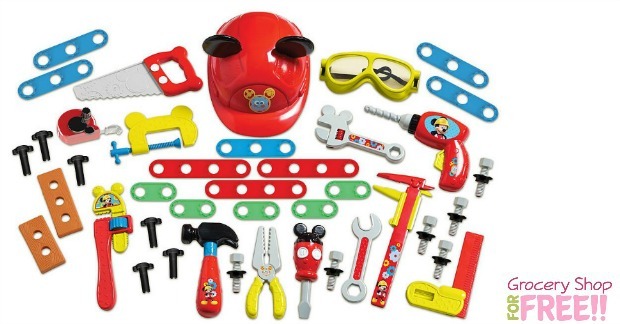 This 50 piece show inspired tool set brings the world of Mickey Mouse Clubhouse to your little Mousekadoer. They can fine tune their motor skills as they hammer, drill saw, measure, twist and turn! Set includes, manual powered drill, moving saw blade, interchangeable screwdriver (Phillips & flathead), play measuring tape, wrench, pliers, play wood, screws, nuts, and nails just to name a few. This 50 piece show inspired tool set brings the world of Disney Junior’s Mickey Mouse Clubhouse to your little Mousekadoer. They can fine tune their motor skills as they hammer, drill saw, measure, twist and turn! Set includes, manual powered drill, goggles, moving hacksaw blade, interchangeable screwdriver (Phillips & flathead), play ruler, ratchet, wrench, pliers, play wood, building links , screws, nuts, and nails just to name a few.